Link to Frequently Asked Questions. Welcome to the Extended Craxford Family Genealogy Magazine. This Help page will give you a short overview of how to find your way around and get the most out of our site. It will hopefully give you the basic navigation tools needed to make your visit both enjoyable and informative without a lot of difficulty. Please bear in mind that this section is not a complete how-to guide and some features are only available to logged in registered users (use the symbol above). You can see the criteria required to apply for a login account on our Terms & Conditions page. Also, if you find any errors or want to make suggestions, you can learn how (see Editing/Correcting) below. Many of us now use a genealogical program and most titles have a very graphical look to them. You can see your family group sheets, display charts and access many other features. This website is much the same except that, instead of it being on your computer, it is on the internet. This walk-through will introduce you to the primary functions of the site. The bold links embedded on this page will open a second window (or tab); you can follow these steps in the new window/tab while referencing the steps here. As an example, the following link opens a new window (or tab) to Page 1 of the RED Pages. Features of that page can be seen and the window/tab can also be used to explore the features discussed below. Please let us know if you have needed help on something not covered in this section or in our FAQ (Frequently Asked Questions) ( )page. The site is designed with two different functions in mind. At its core is the family database holding currently about 9500 individuals who are Craxford ancestors or who have become linked to the family by marriage (more or this later). The other aspect of the site is the magazine which has become quite extensive and now holds about 200 articles. The magazine has been devised like a colour supplement and each colour is devoted to the stories of one branch of the family. The Home Page acts as a wrapper for the magazine and displays the banners which are links to the approriate section. Under each banner is a brief list of the main surnames of interest and a link to the latest story from that section. Page 1 of the RED pages is a little different as it acts as the introductory page to the magazine and the web site and lists the latest three added articles. The web site is best viewed at a screen resolution of 1024 x 768 or better. Resolutions lower than these are likely to result in horizontal scrolling of the page. The site has been tested on a wide variety of browsers but Internet Explorer 9, Google Chrome or the later versions of Firefox are recommended for best results. Pages are generally formatted in one of two ways. Display and search result pages are usually presented at full screen width whereas articles are of fixed width to facilitate printing. We have tried to make navigation around the web site as simple and as intuitive as possible. The article pages have a left hand menu bar which provides search facilities, a link to the Guest Book, links to other articles within the section, links to the other colour sections and (on page 1 of the RED pages) to a variety of reference function. You may notice that the contents of the menu bar will change appropriate to your place in the magazine. On all pages, like this one, there two further sets of navigation aids. To the right (or top row on narrow pages) beneath the banner are four drop down menus: Find - Media - Info - Magazine which can access any area of the site. If you hover the mouse over the menus there are up to 36 navigation options which when clicked will access that page or function. Step Back - Takes you back to the last page you were looking at. Section Pg1 - Takes you to the first page of the suppliment you are reading (in this case the BLUE pages). Help - Shows the Help / FAQ (these) pages. Logout/Login - Logout of your session or Log back in. Some pages also have an additional icon: Add Bookmark icon. This lets you keep a list of your favorite pages on this site. This will give you a list of the results that were found to match this name. On this list, click on the name of the John whose Person ID is "I193" - Born 3 November 1835, Derbyshire (third from the top). You are now at his Individual Page, the header of which you see below. Take a few minutes to orient yourself with the layout. This is the "core" display of the genealogy pages. The standard view shows all of the most pertinent 'Personal Information'; the other views listed in the green bar limit information to a specific category. Note that the personal information is divided into three sections -- the Individual selected, his/her Parents, and his/her Spouse and Children (if any). (NOTE: At this stage information on anyone considered to be still alive will be truncated and merely show as "Living"). Clicking on the "Group Sheet" link next to the appropriate Family ID will bring up either the Parental Family Group sheet (parents and siblings, with the individual as a child) or the Selected Person's Family Group sheet (spouse and children, with the individual as a parent). Try these out. Click on the Event Number pin to open the map in a new window. The pins are colour coded to give an indication of the closeness of the event to the actual location. If you are using FireFox, you can right click and open in a new tab rather than a new window. On the map in the separate window, you can get driving directions to or from this location. Our site is set to display these images as satellite views with names superimposed. You can also click the Map or Satellite buttons to view as a conventional the map or as a satellite picture without names. 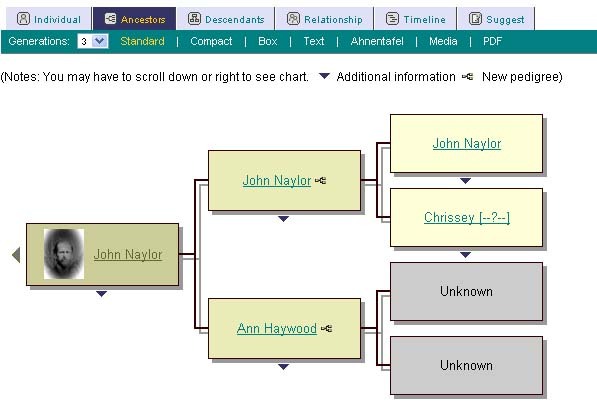 1) Click on "Ancestors" tab which produces a dynamic chart. The default is the "standard" view which is initially set to two generations. Each generation is shown in a slightly different shade, getting progressively lighter with each older generation. Clicking on any of the names on the chart will take you to the individual sheet for that person. Notice that there are little blue arrows pointing down beneath many of the boxes. If you hover your mouse over the arrow (not click!) a drop-down list for that person will open. You can click on a name in that box to take you to their individual sheet. Clicking on any icon will show the next generation above (ancestors); clicking on the icon will show the ancestry starting from the next generation below. Wherever you see the pedigree icon , you can click to show the ancestry from that individual. Note that in the green bar just above the chart, you can specify the number of generations you want to display but beware that the page will get increasingly wider and longer, requiring more scrolling, as you increase the number of generations. 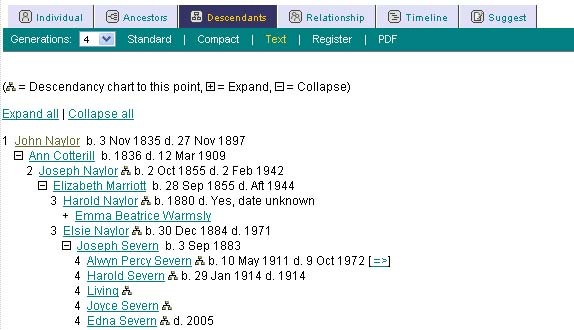 In the green bar there are a number of other Ancestor chart views available by clicking on Compact, Box, Text, Ahnentafel, or Media. The latter displays both lines of parentage for any individual -- and lists that person's grand-parents, great-grandparents, and so on -- as far back as is known, based on the number of generations selected for the display. The icon that may be shown alongside a name in the Media display means that at least one photo, history, or other media item exists for that individual. The Ahnentafel chart (also known as an ascendants table - See Wikipedia article on Ahnentafel for details.) lists all the generations in tabular form, complete with all children and birth, marriage, death, and burial details if known. Try clicking on each of the Ancestor display options to see what they offer. 2) The "Descendants" tab gives you a listing of all descendants of this individual. The default view is the "Text" list, also known as a "descendant drop chart" - (the illustration above has been set to four generations although the default is '1'). Notice that in many places there is a little white box with a minus sign in it. Click this box and that branch of this tree will collapse to this position. Try it! Also, once the descendants are displayed in this text format, you can show a graphic view (with photos) of a specific branch of descendants from that ancestor by clicking the descendant icon next to the descendant whose chart you wish to display. This chart includes the siblings of each ancestor. Thus, the younger the individual, the greater the number of generations in the chart; and the greater the number of siblings in a family, the wider the chart becomes. Try clicking on the other types of Descendant charts, listed on the green bar: Standard - a traditional "tree" with photos (where available), Compact - without photos, and Register - a list of generations in tabular form, similar to Ahnentafel. 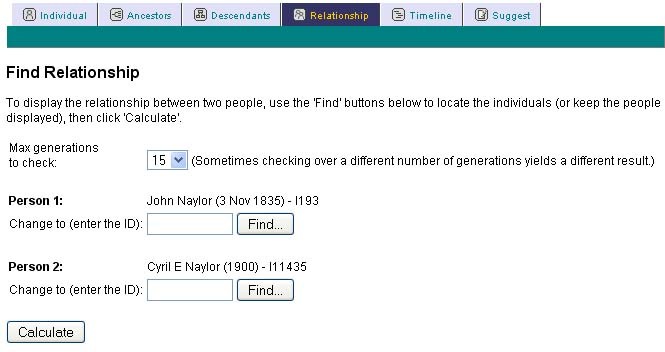 To demonstrate the above relationship just click on the "Find" button under "Person 2" and search for "Naylor Cyril" (remember, last name on top). 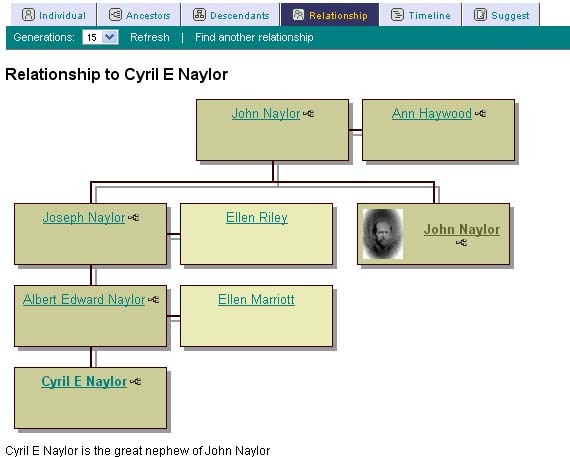 Select 'Cyril E Naylor' (ID-I11435) and click "Calculate"
4) The "Timeline" tab allows you to view a list of important (and some not-so-important) events that occurred during his lifetime. Hovering over the timeline with your cursor will reveal that individual's personal events (birth, marriage, births of children, death). Searching for a name in the database. If you know who you are looking for, then you are already halfway there! Just use the Search box on the right side of the home page (surname on top! ), and you will be shown all the records in the database that match your request. If you need to be more specific in who or what you are looking for, use the "Advanced Search" feature on the home page or by clicking on the search icon in the upper left hand corner of every page. There, you can specify several different criteria to search against, including birth and death information as well as spousal information. This is how to search for a woman when you know only her married name (use the "Spouse's Last Name" field). You can even search by event or place. Looking at places ... The gazeteer is arranged in a similar fashion to people. Clicking on "Places" will give a variety of options including an alphabetical list of locations by index letter and the top 30 listing of the largest locations (by included places). You can drill down on the latter list to individual towns, streets and addresses. Try the following: Click "Tyne and Wear", then "South Shields, Tyne and Wear" (there are about 64 options), then "Wellington Street, South Shields, Tyne and Wear" (about 10 options). You will also see that many of the entries have a small spyglass at the end of the line. Clicking the spyglass will show all the people and events associated with that place. In this example, at one level, you can see all the people who lived at 40, Wellington Street (at house level) and, one level higher, all the people who lived in "Wellington Street, South Shields, Tyne and Wear" (street level) including those at No.40. Photographs and other media can be linked to individual and family records. We have added many photographs, certificates and other media and have many more still to categorise. We would very much like to hear from you if you are able to provide material showing or relevant to anyone in the database. Please contact us by email (there is a link on most of the article pages) or let us know if you can offer anything. There is much more functionality on the website but this walk through should be a good introduction to the system. Feel free to explore; you can't break it. But if you do find page errors or anything wrong please let us know so we can fix it! We are indebted to Graham Chamberlain for his advice and the use of his templates in setting up these Help and FAQ pages. Thanks and appreciation are also due to Jerry Liebowitz, Eddy Belew, Bret Rumsey, and Steve Winslow, whose TNG genealogy websites' Help pages inspired this page.